If you’re trying to narrow down the best waterproof Bluetooth speaker of 2018, then you’ve come to the right place. We have scoured the internet to bring you the 10 best options available. For the purposes of this article, we have stuck to the portable Bluetooth speakers. We have included options based on budget, varying waterproof ratings, size, and features. Many of our top 10 choices include premium features like a built-in speakerphone, the ability to pair more than one speaker and there are a couple with cool LED light displays. We even have two of the best budget waterproof Bluetooth speakers, in case your decision is based on cost. Funny enough, the name is in the title. We consider a waterproof Bluetooth speaker to be portable and have a minimum IPX5 waterproof rating. 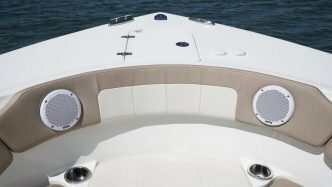 Without getting too technical, here is a quick breakdown of the waterproof ratings featured in this article. IPX5 Protected against sprays of water from all angles. IPX6 Protected against jets of water sprayed from all angles. IPX7 / IP67 Protected against submersion up to 1m for 30 minutes. IPX8 Protected against submersion, to a depth and time specified by the manufacturer. The Sony Extra Bass range of speakers and headphones is hugely popular. The products are well known for the serious bass boost these products offer which makes listening to music that much more enjoyable and exciting. The Sony SRS-XB41 is just small enough to be considered a portable speaker but big enough to produce some serious sound. The SRS-XB41 is IP67 rated which, like IPX7, protects the speaker to a depth of 1m for up to 30 minutes. The SRS-XB41 floats too, which means it’s safe even around deep water. What’s most impressive is that the SRS-XB41 is also protected against salt water which makes this a great speaker for the beach. The SRS-XB41 features dual 2.2” drivers producing an impressive 30W of power. In addition, there is a passive bass radiator to improve bass response. The speaker will easily fill a small to medium sized room with good quality sound. Even at high volumes, the SRS-XB41 experiences minimal distortion or break up. The sound quality on the SRS-XB41 is as good as you would expect from Sony. The bass on this speaker is awesome! Better than any other portable Bluetooth speaker of this size. The SRS-XB41 delivers a nice punchy bass sound which makes the speaker exciting and fun to listen to. The mid-range and highs are upfront, delivering excellent clarity for a compact speaker. The SRS-XB41 also features a LIVE mode which is supposed to improve the clarity of the speaker offering a better soundstage. The result is a slight improvement in audio separation but I found the normal mode sounds better. The SRS-XB41 features an array of buttons to control various elements of the speaker and sound. On the main panel you have your play/pause, volume up, volume down, LIVE mode and on/off/Bluetooth buttons. The SRS-XB41 has a built-in speakerphone with the play/pause button doubling as the control for incoming calls. Also on the top panel is an NFC tag for quick pairing your NFC enabled devices. On the rear, behind a watertight seal, you’ll find another three buttons. The first is a battery button which lets you know the remaining battery life. The WPC and ADD buttons give you a couple options when pairing additional SRS-XB41 speakers. The WPC button allows you to pair multiple SRS-XB41 speakers together, 100+ according to Sony while the ADD button allows you to pair two SRS-XB41 speakers in stereo. The LED lights and futuristic design aesthetic makes the SRS-XB41 one of the coolest looking waterproof Bluetooth speakers on the market. There is an LED strip which surrounds the speaker grille with LED strobes mounted on the speaker drivers. The lights pulse and change with the music adding a party vibe to your listening experience. You do have the option to turn the lights off which obviously saves battery life. The SRS-XB41 features a built-in battery with 24-hours of battery life. This is assuming you don’t use the lights and the speaker operates at 50% volume. You have the option of recharging the SRS-XB41 battery using an AC adapter or micro USB. The AC Adapter will obviously charge the battery faster while the micro USB is convenient if you only have a laptop or power bank to charge off. There is even a USB power output so you can charge your mobile devices off the SRS-XB41. If you’re looking for a really fun waterproof party speaker with big sound and even a light display, then the Sony SRS-XB41 should be at the top of that list. This amazing speaker allows you to pair an additional SRS-XB41 in stereo or multiple speakers to make one big sound system. The SRS-XB41 is also very rugged with an IP67 waterproof rating and the ability to even withstand salt water. If you’re looking for the best waterproof Bluetooth speaker, then the SRS-XB41 is going to be your best choice. If you regularly follow our product list recommendations, you will have noticed that we almost always feature a JBL product where one is available. A lot of the time these JBL products are in the top 3 if not pole position. The JBL Charge 3 is one of the most popular waterproof Bluetooth speakers on the market at the moment and for good reason. 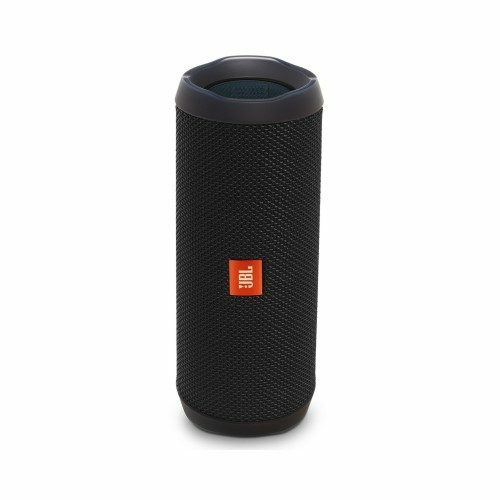 The JBL Charge 3 is a cylindrical Bluetooth speaker with a woven rubberized mesh covering most of the speaker. The Charge 3 carries an IPX7 waterproof rating protecting it up to a depth of 1m for 30 minutes. The speaker floats when thrown into the water and will even continue playing music. The water around the speaker vibrates when in water which looks really cool. The Charge 3 sounds really poor when in the water so don’t expect to throw the speaker in the pool and have it float around playing music. The Charge 3 features 2 x 10W speakers with a bass radiator at either end of the device producing 20W of power. One thing to note is that the speakers on the Charge 3 appear only on one side. At first glance, the speaker looks like it may have a front/back speaker configuration offering 360° sound but unfortunately, this isn’t the case. The Charge 3 is loud enough to fill a small room in an apartment or dorm and would be for background music around the pool too. The 20W speaker is loud enough to get a party started with 4-6 people but probably not loud enough for any more than that. As to be expected from JBL, the Charge 3 sounds really good for a compact portable Bluetooth speaker. There is a decent amount of bass which is largely due to the help from the two bass radiators. The Charge 3 does a really good job of producing good intelligibility in the mids and highs. The overall sound quality is rich in bass with excellent clarity. Really impressive for a speaker this size. At full volume, the speaker does start to struggle a little. The bass becomes wooly with the mids and highs on the border of distorting. Having said that, the Charge 3 is really loud and I wouldn’t see it necessary to push it to 100%. The Charge 3 allows for Bluetooth and ⅛-inch AUX. The ⅛-inch AUX is located behind a watertight seal so you wouldn’t want to use this input if you’re going to be around water. The speaker features Bluetooth version 4.2 which has a range of 33ft. The Charge 3 offers some control over a paired Bluetooth device with play/pause, skip and volume adjustment. This is handy to still have control over your phone while you’re in the pool. There is also a built-in microphone so you can answer incoming calls. The call quality is good but you do need to be in close proximity to the Charge 3 to be heard properly. As with many Bluetooth speakers these days, the Charge 3 includes a speaker pairing feature. JBL Connect allows you to pair a second Bluetooth speaker to the Charge 3. What’s cool about JBL Connect is you aren’t just limited to another Charge 3. You can pair with any JBL Flip, Charge or Extreme with the JBL Connect feature. Older models may not have this feature so make sure the JBL device has the JBL Connect button which is usually located next to the power button. Most impressive is the Charge 3 20-hour battery. This is recorded at continuous playing time at 50% volume. Playing at higher volumes will obviously run the battery down quicker. 50% is a decent amount of volume, perfect for background music. There is also a USB output on the rear so you can charge your mobile device. Again, this will affect battery life. Available in six colors including black, teal, gray, red, blue and camouflage. The JBL Charge 3 is popular for a reason. It’s a great sounding, reliable Bluetooth speaker which is lightweight, portable and most important, fully waterproof with an IPX7 rating. 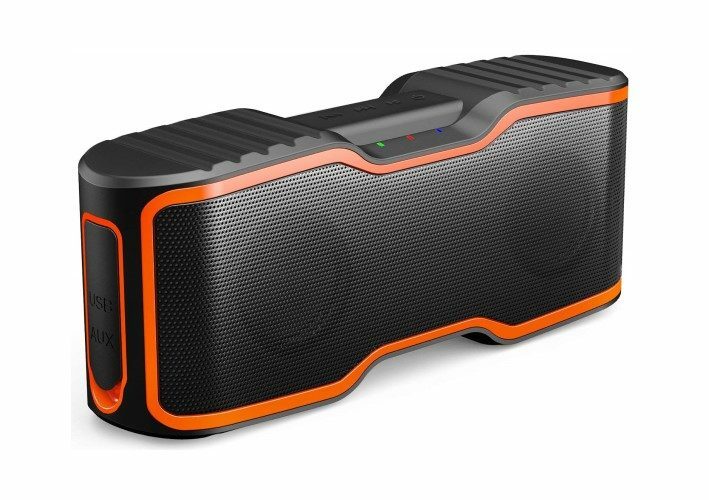 This is a great waterproof Bluetooth speaker for playing background music in a dorm, at a BBQ or even around the pool. The speaker is loud without being too loud that you’ll bother the neighbors. The Charge 3 comes in at just under $110 which I think is excellent value for the quality you get. If you’re looking for an ultra-portable waterproof Bluetooth speaker (we’re talking palm sized), then the Bose SoundLink Micro is one to check out. This incredibly small speaker weighs just 10.24oz which is the same as some over-ear headphones. The SoundLink Micro is IPX7 rated but doesn’t float. So if you drop the SoundLink Micro in water that’s deeper than 1m, you could damage the speaker. Also, if the water is murky, like the ocean, dam or river, there’s a good chance you won’t be able to see the SoundLink Micro to retrieve from the bottom. The SoundLink Micro features a silicone rubber coating around the entire speaker. This obviously makes the speaker waterproof but also gives the SoundLink Micro a premium look and feel. On the rear of the Bluetooth speaker is a silicon strap to attach the SoundLink Micro to a backpack strap, bike handle or even a hook in the shower. Bose doesn’t specify the driver size or power output of the SoundLink Micro but I would guess this to be around 6-10W. The SoundLink Micro is pretty loud for its size but I would say you need to be up close to the speaker to get a good audio reference. There is not much bass, however, the SoundLink Micro does have a nice little thump to it, certainly a lot more than any other palm-sized Bluetooth speaker on the market in 2018. The mid-range and highs are clean giving the speaker good clarity. Again, for listening within a couple feet you’ll enjoy a good sound but further than that and the SoundLink Micro loses some of its character. This isn’t a bad thing, it’s as you would expect from a speaker this size. The SoundLink Micro features a total of five buttons. These include power, Bluetooth pairing, volume up, volume down and a multifunction button. The multifunction allows you to play/pause and skip tracks forward and backward. The SoundLink Micro has a built-in microphone with enables the device to be used as a speakerphone. The multifunction button allows you full control over the speakerphone including putting calls on hold. You can also wake up Siri or Google for voice commands. The SoundLink Micro has a built-in battery with a 6-hour battery life. There is a battery life 5-LED indicator which shows when your battery is at 20%, 40%, 60%, 80% or fully charged. If you want an ultra-compact waterproof Bluetooth speaker, then the best on the market at the moment is the Bose SoundLink Micro. I would say this is better sounding than the JBL Clip which is also an ultra-compact palm-sized speaker. Keep in mind these types of Bluetooth speakers are small and really only shine as personal speakers. This is not the type of Bluetooth speaker you can put on during the BBQ and expect a decent level of background music. The built-in speakerphone performed better than expected to make this a really versatile little speaker. 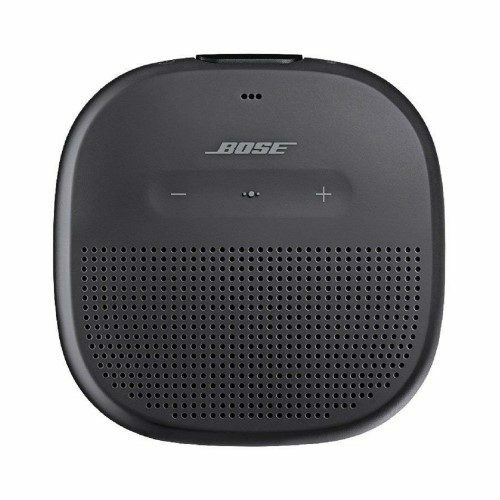 For under $100, the Bose SoundLink Micro is an excellent choice for those looking to take their music on the go. If you like the JBL Charge 3 but perhaps want something slightly smaller, then the JBL Flip 4 is exactly what you’re looking for. The Flip 4 is just a little more than half the size and weight of the Charge 3 but almost as powerful. The Flip 4 is IPX7 rated but sadly does not float like the Charge 3. This means if you drop the Flip 4 in water it will sink to the bottom. As it’s only rated to 1m submersion, you want to be careful with the Flip 4 around deep water. The Flip 4 features dual 8W drivers to give the speaker a total of 16W of power. Like the Charge 3, the speakers are only located on one side which means you don’t get 360° sound as you do on some competitor models. There are two bass radiators located at either end of the Flip 4 to compliment the low-end frequency response. Like the Charge 3, the Flip 4 is covered in a woven rubber material with rubber silicone around the sides. On the top of the speaker is an on/off switch, battery indicator and the JBL Connect + button which I’ll get to in a bit. On the speaker grille, you have your play/pause, volume up, volume down and Bluetooth pairing button. The play/pause also answers, ends and rejects incoming calls for the built-in speakerphone. The built-in microphone allows you to perform voice commands with Siri and Google too. JBL Connect + is slightly different to regular JBL Connect. With JBL Connect you could pair one other JBL Connect speaker as long as it had the JBL Connect feature. With JBL Connect + you can now pair 100+ JBL Connect + speakers at the same time. 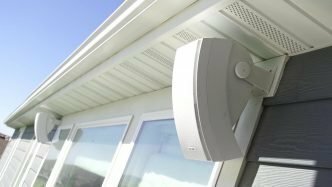 If you have several friends with JBL Connect + speakers, you could essentially build a serious little PA system. The downside? JBL Connect + is not compatible with regular JBL Connect! This is a big let down from JBL. I feel they could have still allowed you to perform a single pairing between the two Connect versions. The Flip 4 produces a nice punchy bass response which is on par with the Charge 3. Mid-range and highs are clear but lack detail, which is usual for a speaker of this size. Having said that, the Flip 4 is fun to listen to, especially for the amount of bass this little speaker produces. The only disappointment with regards to sound is the built-in speakerphone. Where JBL got this right with the Charge 3, they seem to have got things wrong on the Flip 4. Voice sounds distant with a slight echo making it difficult for an incoming caller to hear you. You need to be right up close to the Flip 4 to be heard properly and even then it’s not 100% clear. A quiet environment indoors is best for using the speakerphone. This doesn’t seem to have an effect on Siri or Google which seem to work fine with voice commands. The Flip 4 features a built-in battery with 12-hour battery life. The battery will fully recharge from flat in around 3.5 hours. Due to the Flip 4 size, there is, unfortunately, no charging output for mobile devices like you get on the Charge 3. 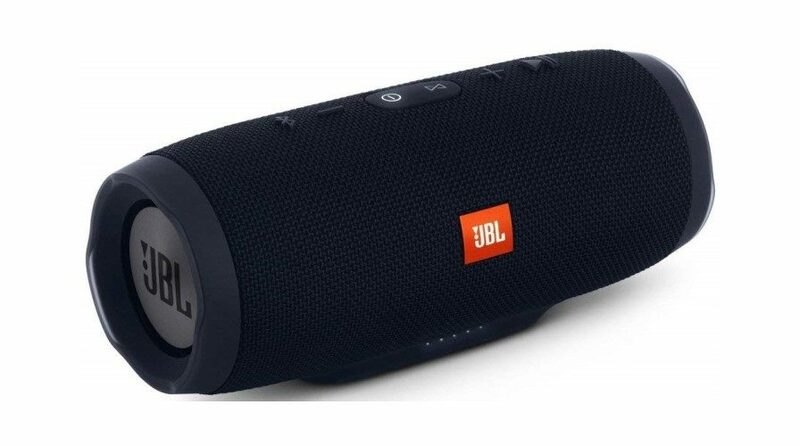 The JBL Flip 4 is perfect for dorms and other small rooms where you might need some background music. The speaker is compact enough to throw in a backpack or even lady’s handbag which is perfect for those on the go. There is also a hook with a supplied string so you can hang your Flip 4 from a backpack, bike or a hook in the shower. For its size, the JBL Flip 4 sounds awesome, a decent amount of bass and clarity, more than most competitors of a similar size. The Flip 4 retails for around $80 making it one of the most affordable premium Bluetooth speakers on the market. They say dynamite comes in small packages which is especially true for the Oontz Angle 3. The Oontz Angle 3 is so small you can literally hold the speaker between two fingers. With a speaker this small you wouldn’t expect the amount of power you actually get from the Oontz Angle 3. 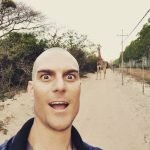 It’s pretty crazy! The Angle 3 carries an IPX5 waterproof rating which means it can handle sprays of water but cannot be submerged. So fine next to the pool but not in the pool. The Angle 3 features a powerful 10W speaker driver with a bass radiator at the bottom. The radiator is pretty powerful and at high volumes will vibrate enough to move the Angle 3 around. So make sure you don’t place this speaker too close to the end of a table because it will fall off. If you intend playing it loud, you will need to find something to keep the speaker in place so it doesn’t move around too much. The Oontz Angle 3 is acceptable sounding in the mid-range and high frequencies. The response is clear enough for listening to music but don’t expect high quality from a speaker this size. Having said that, the Oontz Angle 3 is a lot of fun to listen to. The little speaker is so impressive you can’t help but love the Angle 3. On one end of the Oontz Angle 3 is a small control panel with several buttons to control your paired Bluetooth device. There are your standard play/pause and volume control buttons as well as a multifunction button for Bluetooth pairing and call management for the built-in speakerphone. On the side of the Angle 3 is a small power button with the ⅛-inch AUX and micro USB located below behind a watertight cover. If you like the Angle 3 but want some more power, then the Angle 3 Plus is an option to consider. The Angle 3 Plus is ever so slightly bigger than the Angle 3 with the same 10W power output but with a slightly better bass response. In my opinion, the design aesthetic of the Angle 3 Plus is slightly better than the Angle 3. For only a few dollars more, the Angle 3 Plus is certainly worth considering over the Angle 3. Oontz Angle 3 travel bag is available as a separate purchase. When it comes to sound quality, the Oontz Angle 3 isn’t going to win any prizes. But when it comes to character, the Angle 3 is amazing. The sound quality is fine if you just want a speaker for background music in your room, dorm or even in the shower. For outdoor BBQs or hanging out with friends, the Angle 3 might be a little underpowered. As a personal speaker, the Angle 3 is great and I would definitely buy this as a speaker for traveling or working alone at the PC. The Angle 3 would also make a good speaker for watching movies or playing games on your phone. In recent years Anker has established themselves as the leader at the budget end of Bluetooth speakers. The Anker Soundcore is possibly one of the best selling waterproof Bluetooth speakers of all time and continues to sell well with thousands of 5* reviews online. 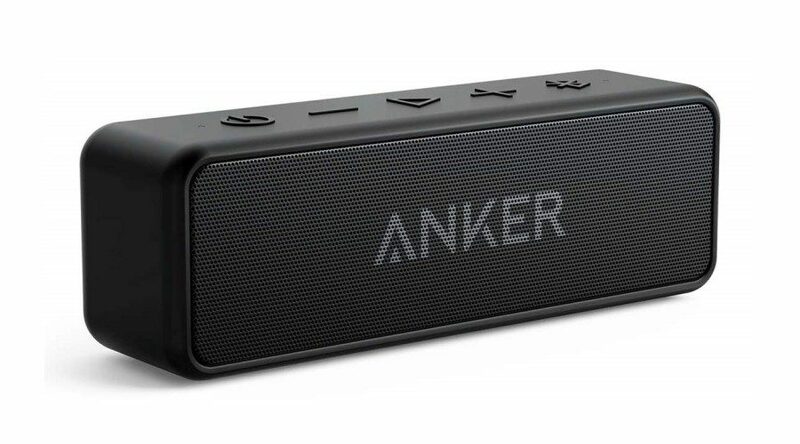 The Soundcore 2 is the latest version of the original and one of the smallest models in the Anker range and features a waterproof rating of IPX5 which essentially makes the speaker splashproof. You definitely don’t want to submerge the Soundcore 2 or expose the speaker to too much water. The Soundcore 2 features two 6W speaker drivers to deliver 12W of power. A bass radiator is located in the center of the two drivers to complement the low-end frequency response. The Soundcore 2 produces a surprising amount of bass and even has rubber feet to prevent the speaker from moving around. The Soundcore 2 can be turned up pretty loud and only really starts to distort when the volume gets near 100%. The speaker easily produces enough sound to fill a small room or even outside at a BBQ. The audio quality of the Soundcore 2 is actually better than expected for a Bluetooth speaker under $40. While this isn’t as good as premium JBL, Bose or Sony models, the Soundcore 2 is not far off. The bass response is good with good clarity in the mid-range and highs. As mentioned, only when you turn the speaker up really loud will you experience any breakup or distortion. At 70-80% the Soundcore 2 sounds nice and full so I don’t see any reason to go above that. Call sound quality is okay, the caller can hear you but your voice does appear distant and not 100% clear. It’s best to talk almost directly into the Soundcore 2 for the other person to hear you properly. For taking a quick call, the speakerphone works just fine. On top of the Soundcore 2 is a 5-button control panel including power, Bluetooth pairing, volume up, volume down and play/pause. There is also a LED battery life indicator which will flash red when the Soundcore 2 is below 10% battery life. The play/pause is a multi-function button which also allows you to control the built-in speakerphone. You can answer, end or reject incoming calls and even place a call on hold. Holding play/pause for 1 second when no audio is playing will wake up Siri or Google for voice commands. It’s great to see so much premium functionality in a budget speaker. The Soundcore 2 features a built-in battery with an impressive 24-hour battery life. This is one of the best we’ve seen among ultra-compact Bluetooth speakers. While this will most likely see you not having to charge your Soundcore 2 too often, Anker strongly recommends charging the Soundcore 2 at least every 45 days to preserve the lifespan of the battery. If you’re after a waterproof Bluetooth speaker with premium features but at an affordable price, then the Anker Soundcore 2 is just what you’re after. The Anker range is extremely popular with thousands of 5* reviews, all those people can’t be wrong. You do need to accept the fact that this is a budget speaker and won’t have the same audio quality as premium models. Having said that, you’ll only really notice the difference if you perform a comparison test. The Soundcore 2 is ultra-lightweight and compact, small enough for a backpack, laptop bag or even handbag making it the perfect travel companion. For under $40, the Anker Soundcore 2 delivers excellent value at an affordable price. If you’re after something trendy, then anything from Ultimate Ears (UE) is going to be a good option. The UE Wonderboom resembles something like a tubby soda can with woven rubberized exterior over the speakers and silicon rubber on the top and bottom. 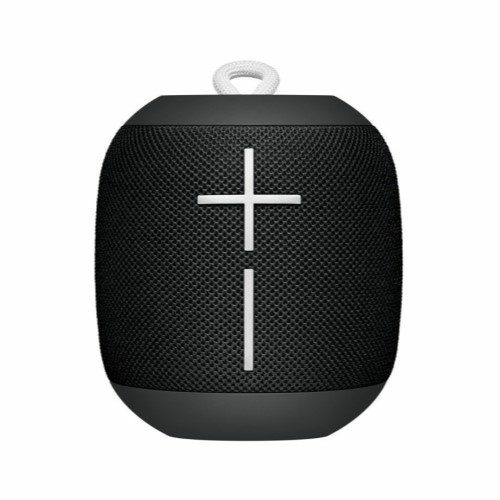 Even the buttons and logo on the UE Wonderboom add both style and function to this waterproof Bluetooth speaker. Ultimate Ears does not specify the actual power output of the Wonderboom, however, I would put this somewhere between 15-20W. Although small, the Wonderboom is surprisingly loud and powerful enough to easily fill a small to a medium sized room. What’s great about the Wonderboom is that the drivers are located on opposite sides giving you 360° sound. Great if you want to place the speaker in the center of the room so everyone can enjoy the music. For outdoor get-togethers around the pool or BBQ, the 360° sound means no one is left out of the party. If you have a second Wonderboom you can pair the two to double your sound and spread the party out. This pairing only allows for mono audio and not a stereo left/right sound profile. The UE Wonderboom is a well-balanced speaker with no apparent bass boost. With that said the speaker certainly punchy in the low end with enough bass to satisfy most tastes. The mids and highs are clear and present. At high volumes, there does appear to be some breakup and distortion across the frequency spectrum so it’s best not to operate the Wonderboom at full volume. There is a large plus/minus button located on the side of the Wonderboom which, besides looking cool, also operate the volume control. On top of the speaker are three additional buttons for power, Bluetooth and the UE logo multi-function button. The multi-function button enables you to play/pause and a double tap allows you to skip a track forward. If you have two Wonderbooms, holding the UE button on both will initiate pairing the two speakers. The Wonderboom only has a Bluetooth input so, if you’re looking for a Bluetooth speaker with a ⅛-inch input, you might want to consider one of the other options in this article. If you’re prone to breaking portable Bluetooth speakers, then you’ll be pleased to know that Ultimate Ears have made this a difficult task with the Wonderboom. The speaker is IPX7 rated to a depth of 1m as well as mud and shock resistant. There are loads of videos from reviews showing people soaking their UE Wonderboom in the mud and then hosing it off to work as normal. The speaker can also be dropped on a hard concrete floor and work just fine. Personally, I would reserve testing this and rather be happy knowing my UE Wonderboom can survive if the challenge presents itself. The UE Wonderboom is available in 11 stylish colors. If you’re looking for a rock solid waterproof Bluetooth speaker, then the UE Wonderboom is an excellent choice. This stylish little speaker not only looks good but sounds good and can survive a serious beating. There is no ⅛-inch AUX input and no speakerphone so if you require these features it may be better to consider another option. On the other hand, if you just want to make a noise in style, then the UE Wonderboom is the speaker for you. 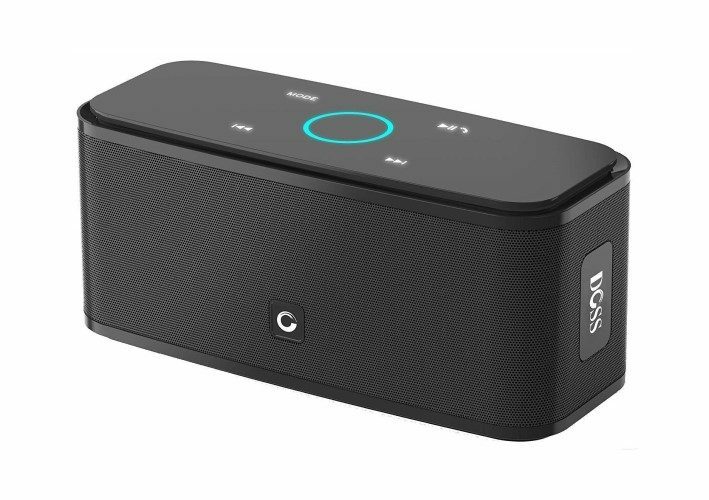 One of the most impressive budget waterproof Bluetooth speakers on the market is the DOSS SoundBox Pro. The SoundBox Pro is lightweight and compact but still packs a serious punch competing with the likes of JBL and Sony. The speaker comes with an IPX5 waterproof rating which basically means the SoundBox Pro is splashproof. So do not attempt to submerge this speaker! The SoundBox Pro features dual 10W drivers with two passive bass radiators producing a combined 20W of power output. There is also a bass boost feature which we’ll get to in a bit. The SoundBox Pro is incredibly powerful for its size taking on the JBL Flip 4 and Charge 3. This speaker easily has enough power to fill a small to medium sized room and even allows you to pair several SoundBox Pro speakers together for bigger sound. The audio quality on the SoundBox Pro is really surprising. For a budget Bluetooth speaker it truly performs giving the premium speakers a run for their money. The bass is nice and punchy and with the bass boost engaged, produces a lot more bottom end than the JBL Flip 4. The mid-range and highs are as upfront but not quite as clear as the Flip 4. When you consider that the SoundBox Pro is half the price of the Flip 4, the choice between the two becomes obvious. The SoundBox Pro does start to distort a little when pushed near 100% which seems to be standard among all Bluetooth speakers this size. If you’re swayed by flashy lights, then the SoundBox Pro will impress you even more. Around the speaker grille, there is a LED panel which changes 6 different colors and 3 display patterns. You can set this to pulse with the music, gently fade or just stay on one solid color. The LED is a really cool effect, especially in the dark. The SoundBox Pro also features a built-in speakerphone which actually works pretty well. You do need to be up close for the person on the other end of the line to hear you properly but the call quality is good enough to carry a conversation. The SoundBox Pro has several buttons on top. On one side there’s your standard play/pause and volume control as well as an ADD button for pairing more than one SoundBox Pro and the mode button for adjusting the LED lights. The opposite end has the BASS BOOST button and power/Bluetooth buttons. With the SoundBox Pro, you’re spoiled for choice when it comes to inputs. These include Bluetooth, a ⅛-inch AUX and even SD card. The SoundBox Pro is one of the dark horses in the waterproof Bluetooth speaker market. This is one of those budget speakers you write off because it’s considered a cheap model but in fact, it’s actually a really good Bluetooth speaker. If you’re looking for a budget Bluetooth speaker under $50, nothing comes close to the SoundBox Pro. This is a great little speaker with premium features at an affordable price. If you’re on a particularly tight budget for a waterproof Bluetooth speaker, like under $30, then the Aomais Sport II is certainly one to consider. This affordable Bluetooth speaker features an IPX7 waterproof rating with a tough rubberized exterior built to take a few knocks. In fact, in their marketing Aomais claim you can drive over the Sport II with a car! The Sport II is lightweight and compact enough to fit in just about any bag or handbag – which is great news if you’re looking for an affordable travel speaker. The Aomais Sport II features dual 10W full-range drivers with a rear passive bass radiator producing an impressive 20W of power. The Sport II can easily fill a small to medium sized room and suitable for outdoor events like at the pool or BBQ. For pool parties, Aomais even supplies you with a floatie complete with a strap to keep the Sport II on board. This allows the speaker to float around the pool while playing music. If the floatie tips over, the strap keeps the speaker in place so it doesn’t sink. The Sport II is surprising in the amount of volume and bass the speaker produces. The bass isn’t as defined and punchy as the more premium models, but definitely good enough for the money. Mids and highs are good but again not at the level of premium brands like JBL, Sony or Bose. For under $30, the audio quality is better than expected for sure. The Sport II also features a built-in microphone with speakerphone. The call quality is sufficient enough for a quick conversation but you might battle to hold long conversations. Your voice sounds distant to the caller on the other end which can get fatiguing after more than a minute. The Aomais Sport II allows both ⅛-inch AUX and Bluetooth inputs. Buttons on top of the speaker include controls for any paired Bluetooth device. The buttons include play/pause, skip forward/volume up, skip back/volume down and power/Bluetooth pairing. The same buttons also allow you to control the built-in speakerphone by answering, rejecting and ending incoming calls. The Sport II features a built-in battery with 12-hour battery life (this is continuous play at 50% volume) which is perfect for a full day by the pool or BBQ. The Aomais Sport II is the answer for those looking for a cheap waterproof Bluetooth speaker. The Aomais Sport II is one of the loudest and most bass heavy waterproof Bluetooth speakers under $30. Not only is this speaker waterproof, but it’s extremely durable too. 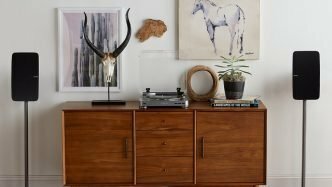 Which is rare for a budget speaker. At under $30, the audio quality is really good and even the speakerphone is good enough for quick phone calls. 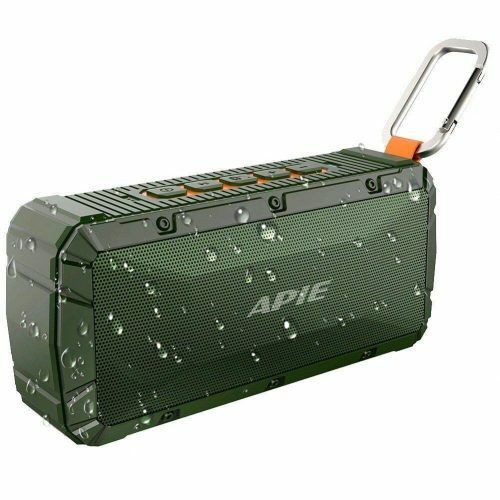 Another great budget waterproof Bluetooth speaker is the APIE Portable Bluetooth Speaker. The speaker comes in at under $30 and, like the Aomais Sport II, is built tougher than most budget Bluetooth speakers. The APIE carries a waterproof rating of IPX6 which means it can handle jets or water but not any form of submersion. The APIE features two 5W drivers and a rear passive bass radiator to produce a combined 10W of power output. The speaker is exceptionally loud of a 10W speaker, certainly enough to fill a small room. 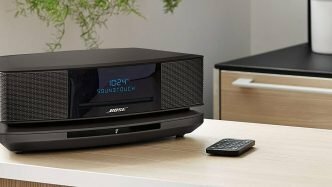 APIE claims this Bluetooth speaker has an enhanced bass but when compared to the more premium models, the extra bass is not as present. The mids and highs are clear, however, there is some noticeable distortion in this range when the speaker gets too loud. Still, this is better than most speakers under $30. The APIE features a built-in speakerphone which can sound somewhat distant and muffled and in some cases has a bit of an echo. The APIE allows for Bluetooth and ⅛-inch AUX inputs. There is a 5-button panel on top of the speaker which allows you to control any paired Bluetooth device. Buttons include play/pause, call answer/end/reject, volume up/track skip forward, volume down/track skip backward and on/off power button. The call button is also used to switch between Bluetooth and AUX. The APIE has a 10-hour built-in battery which is more than enough for a full day of use. The speaker has a carabiner clip which allows you to clip the APIE to a backpack or even hang in the shower. If you’re still confused about which waterproof Bluetooth speaker is right for you, not to worry. We’ve put together this buyer’s guide to help you make the right choice based on your Bluetooth speaker requirements. If cost is your deciding factor then the OontZ Angle 3 is going to be your best choice. We really love this little speaker. It’s really loud, fun to listen to and only costs $26. 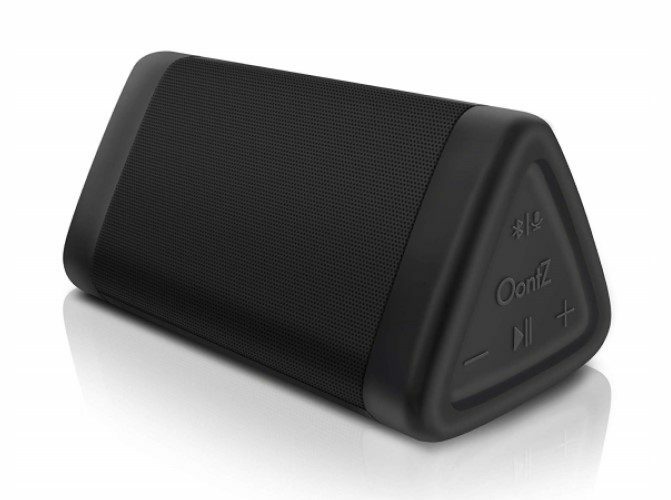 When compared to other Bluetooth speakers, the Oontz Angle 3 does lack a little bass but for $26, who’s complaining. The Oontz Angle 3 is also the most lightweight and compact Bluetooth speaker we reviewed for this article. The loudest waterproof Bluetooth speaker we reviewed for this article is the Sony SRS-XB41. Not only is this the loudest speaker but, it also has the most bass. The Sony SRS-XB41 is definitely a party speaker with the ability to pair multiple speakers together to make even more noise. The speaker carries an IPX7 waterproof rating and floats. The highest IP rating we came across when reviewing speakers for this article is IPX7. This means the speaker will survive submersion to a depth of 1 meter for 30 minutes. If you need to go deeper than that, you might be having too wild a party! If you consider yourself a bit of an explorer and need a waterproof Bluetooth speaker with a good battery life, then there are two competitors to choose from. The Anker Soundcore 2 and Sony SRS-XB41 both feature a 24-hour battery life. The Soundcore 2 costs only $40 while the premium Sony SRS-XB41 costs $150. The benefit of the SRS-XB41 is that you have a USB output for charging your other mobile devices. If you’re buying your waterproof Bluetooth speaker for business and pleasure, then you need something with a decent speakerphone. While most of the models we feature in this article have this feature built-in, it’s a tricky technology for manufacturers to get right. The best we have found is the JBL Charge 3. Although not perfect, when you talk clearly up close to the speaker, you are able to have a decent conversation. If looks and style are what you’re after then the Ultimate Ears WONDERBOOM is one of the coolest looking waterproof Bluetooth speakers on the market. In fact, all Ultimate Ears speakers lead the way when it comes to good looks. 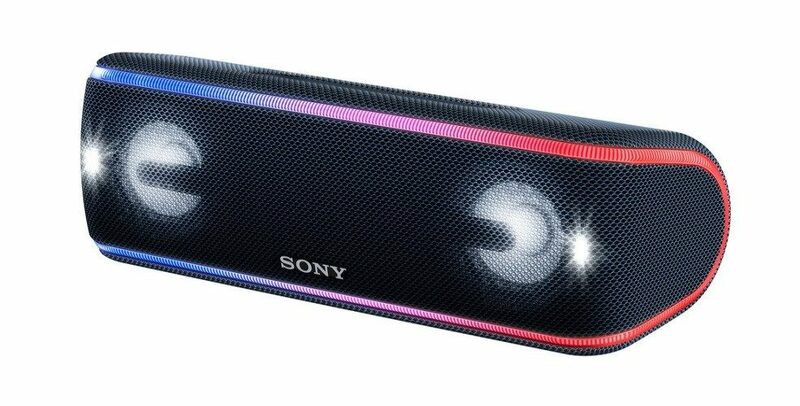 A close second is definitely the Sony SRS-XB41 with its cool lights and sleek design. We’ve put together three top tips to preserve the life of your Bluetooth speaker. Many people treat these speakers as if they’re indestructible just because they’re waterproof. Underneath that rugged exterior, they’re just regular Bluetooth speakers which need to be looked after just the same. Even though your speaker is waterproof, you want to keep it as dry as possible – as much as possible. Just because you can submerge your speaker, doesn’t mean you should. Waterproofing isn’t there for the speaker to accept challenges, these features are really only there just in case. Keeping your waterproof speaker out of the water will prolong its life. If your speaker carries an IPX6 rating or lower, then be especially careful around water. Speakers are not meant to run at 100% all the time. 70-80% volume is usually the best if you want to run your speaker loud, especially for cheaper speakers which tend to distort past this level anyway. If you find you have to turn the volume full every time, you should probably consider a bigger speaker. As soon as your speaker starts to distort or break up, turn the volume down a touch until the sound is clear again. Continuously running your speaker into distortion will lead to permanent damage, no matter how good the brand is. Rechargeable batteries should be charged regularly. If you run your battery flat and leave it for a couple weeks uncharged, over time this will damage the battery and lead to a shorter battery life. Overcharging is another issue. Never leave your Bluetooth speaker charging for hours on end. Most Bluetooth speaker batteries will fully charge from flat in 3-4 hours. Keep an eye on this and when the battery is fully charged, unplug it from the power. Leaving the power in for extended periods or even operating the speaker while plugged in, could damage the battery permanently over time.